I have almost no experience with coding. Luckily, I do have the ability to follow simple instructions, an ability which has served me well during this project. I spent several evenings doing research on how to add Facebook comment integration to this site. There are a large number of articles and resources for this subject, but many are either too simple (and don’t have enough customisation options) or too complex (and are hard to implement if you lack the ability to code). A simple, flexible solution was more difficult to find. This was perhaps because, while many solutions work for generic Wordpress themes, there are fewer resources for my current theme, SimplePress by ElegantThemes. Simple Facebook Connect (SFC) plugin: I couldn’t get this working at first, not realizing that it requires a small amount of coding for integration with SimplePress. More on this in Part 4! Facebook Comments plugin: This plugin slowed down my theme and wouldn’t integrate properly. It is still worth checking out if you are using a theme other than SimplePress. Since I could not, at first, get either of these plugins to work, I started reading the Facebook Developers documentation. They have well-documented articles, for beginners and experts alike, on how to use Facebook comments with your website. The benefit of this solution is how easy it is to implement. The downside is that all user comments are shared across your entire site. 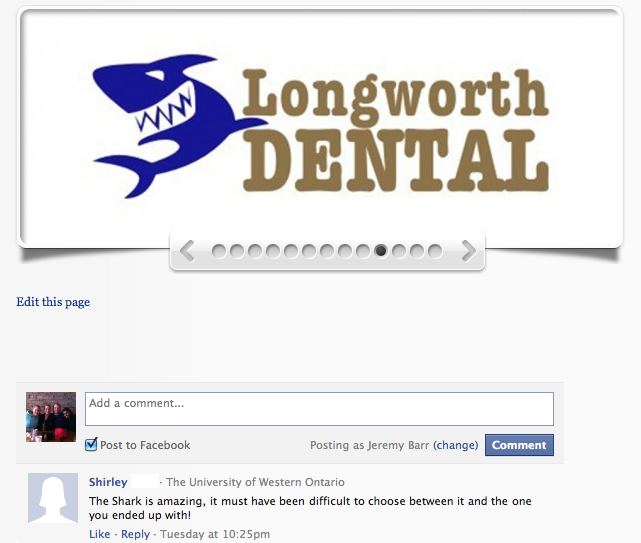 For example, a comment about a “shark logo” was easily understood in its intended post, but was incomprehensible when viewed from other articles. A prerequisite for having Facebook comments in your blog posts, no matter whether you use a plugin or you code everything yourself, is to create your own app. It only takes a few minutes, and at the end, you’ll get your APP ID and your App Secret. This gives you administrative control over comments once people start posting. Following the instructions on the Facebook Developers Page, I started by searching comments.php (from the WP Dashboard, go to Appearance -> Editor) for the following lines. I discontinued this implementation once I learned that I couldn’t set up separate comment walls for separate posts, and that I could not store any of the comments on this site. For a more detailed discussion, read this post by the Facebook Developers (how-to video included). Before giving up, I decided to try one last shot in the dark: e-mailing the author and asking him for help. I e-mailed him the “comments.php” form last night before going to bed. When I checked my e-mail this morning, he had already modified the file so it worked perfectly. I’m sure there’s an important lesson to be learned somewhere in this experience. I read the author’s notes in this blog post, but I had trouble figuring out how to implement it exactly with my theme. For SimplePress (and possibly other ElegantThemes), here are screenshots of what to change. Here is the first code to add. The left side is the original, and the right side has been modified. Here is the second part of the code to add. I still have a lot of testing to do, trying to figure out how all the SFC sub-modules work. But installing SFC is a much better solution than either using Facebook’s comments box or writing all the code from scratch. Comments are stored on-site, people can still comment seamlessly, using their Facebook profile, and coding requirements are minimal. [UPDATE: April 3rd, 2011:] For those of you who are looking for a way to use the actual "Facebook Social Comments" plugin, try looking at David's WordPress Plugins. I haven't tried to use his "Simple Facebook Comments" with an ElegantThemes template, but if you want to implement the Facebook comment system only (without storing comments on your blog) it might be what you're looking for. We started designing our logo late in the building process, once all the construction work had been planned. Our original reason for the delaying the logo design was that so much of the startup loan was already budgeted for other things. Should we have left the logo for last? Designing the logo first made us reflect on what to talk about with our interior designer. In hindsight, it might have been easier to design the clinic first and base the logo on the colors we chose. The criteria we used in choosing our logo designer were simple: we wanted to experiment with a variety of ideas, for a fixed price and to be relatively sure of producing an attractive design. We researched local graphic designers and their quotes varied between $40 and $60 per hour. Unfortunately, we couldn’t find a designer who offered a flat rate. Normally, this wouldn’t be such a big deal: after all, if it takes 3 hours to design the logo, the total cost is still low. The problem was that we didn’t know if it would take 3 hours or 30 hours to complete the design. In the end, we decided on what we thought was a compromise, choosing to do an online contest. Our hope was that having access to more designers would generate more (and better) ideas, while at the same time guaranteeing that we stayed within our budget. To an extent, we were right: we received an overwhelming 281 design variants. The downside, as you can see below, was that the design quality varied greatly between one submission and the next. We could only interact with the designers through a forum-style conversation or through private messages, and we had to extend the contest because some designers didn’t submit their best work until minutes before the deadline. All things considered, we had a good experience. We managed to stay within budget, and our logo was finished within the required time. However, this is certainly not the only way to go, and we would be interested in hearing suggestions from logo designers with the Durham and Clarington regions on better ways to go about the best practices of logo design. Our staff—a term I use delicately for the moment, as it includes only Dr. Sharon and I—recently attended the 2011 Greater New York Dental Meeting, which was held a week ago at the Javits Center. Although I've often visited the state of New York, I've never before been all the way down to the capital. While the conference did not afford us much time to play the tourist, we did manage to see Times Square and take in a show while we were there. It was an informative few days, packed with interesting seminars, reunions with colleagues and an enormous expo featuring thousands of products and services. There were a number of outstanding presentations offered. While Dr. Sharon attended the seminars oriented toward dentists, I was free to attend the seminars on administration. Among the presenters, Kirk Behrendt of ACT Dental stood out from the crowd, noticeably for the depth of his analysis and the hilarious delivery of his presentations. His rendition of a frustrated dentist trying to explain how insurance plans can sometimes compromise patient treatment, à laJack Nicholson in "A Few Good Men", literally had people crying tears of laughter. Kirk is the CEO of ACT Dental, a company that helps American dentists provide "highly personalized care" to their patients. One of the ways he does this is by guiding them through a process of identifying the systems they use to deliver their services to their patients. By "system" is meant each of the processes used in day-to-day work in their clinics; from how the receptionist greets patients to how insurance claims are processed and filed. The philosophy behind the approach is that by taking the time to clearly define each system, the dental team can then begin to make each process more efficient. Their objective is essentially to produce predictable, reliable patient care, especially with regard to: patient health, finances and satisfaction with dental care. Mr. Behrendt has effectively found a way to analyze the structure of a dental clinic in a relatively simple and straightforward manner. To underline the importance of systems in any business, Kirk gave the example of the efficiency of Starbucks employees in New York, where some of the busiest locations serve 300 customers per hour during peak periods. If they were only serving plain coffee to that many customers, it would be considered a tiring yet straightforward task. However, when you order a "tall half-skinny half-1 percent extra hot split quad shot (two shots decaf, two shots regular) latte with whip" (or another of the roughly 70,000 combinations), the staff still present you with precisely what you asked for. Many of you know why. Despite the complexity of the order you give to the kid behind the counter, he or she will follow the system they have in place: they write your name on the cup, fill in the six boxes on the side and pass the cup to the next staff member. Mr. Behrendt remarks that in some of the bigger Starbucks, he suspects the employees don't even know each other all that well, and yet are still able to work as a team to provide a service. Certainly, having employees work in a chain to produce a product doesn't produce the most creative results. Dental staff members must not only be highly skilled, but they must be intensely curious and mindful in carrying out their tasks. However, the preceding example does illustrate a profound point. When the members of a dental team clearly define who is responsible for meeting which of a patient's needs, and then go a step further by systematizing their process, two things are certain: the service they provide will be increasingly effective, and they will be able to reproduce it time and again. When I sat down to do the research necessary for our dental website design, my first step was to search through selected websites and establish a list of elements I wanted to include in this site. Interestingly enough, while I was able to find a number of creative and well-designed sites through Google, most of the elements of my list came from analyzing the sites that I visit regularly. Clicking through my bookmarks, I happened upon our wedding videographer's website, which I had luckily saved. When we used their services, Collin and Carla of Empty Cup Media were perfectly professional, their service was beyond reproach, and more importantly (in the context of this post, anyway), what first enticed us to contact them was the attractiveness of their website. While the rich photography and superbly edited short films immediately catch the eye, the site also offers an interesting series of articles for readers who want to spend more time perusing the site. The combination of visually appealing media elements and well-written posts serve to showcase their talent, as with the entry where Collin proposes to Carla. Obviously, the purpose of a media company's website and a dental office's website aren't exactly the same. At the same time, there are still certain characteristics that are common to both, such as the necessity of exposing the services the organization offers and the philosophy they follow. It turns out that Simon de la Salle, who did a lot of the design work for Collin and Karla's site, has a good understanding of the elements that contribute to a great online presence. He boasts a unique webpage of his own, where (among other things) he shares his thoughts about the Empty Cup Media website. If you are looking for ways to update your own website, there are certainly worse places to start than here. The American Academy of Pediatric Dentistry published an article in 2007 on using "sippy cups" for children. The advice in this article on keeping children's teeth healthy is important for parents everywhere! Childhood caries (or "cavities") are becoming more and more common. One of the main causes is frequent exposure to sugared beverages for extended periods of time. A sippy cup is a transitional tool for your child when switching from a bottle to a regular cup. It must only be used for a short period. The only beverage recommended for use in a sippy cup is water. If you use sugared beverages, limit them to mealtimes and start gradually diluting the beverage until the child gets used to pure water. This is especially important at bedtime, since prolonged exposure to sweet beverages at night can cause extra tooth decay. One of the interesting things about any new project is that there are constantly new things to learn. Once we chose our two-dimensional layout, we thought it might be easier to visualize with a three-dimensional model. This video is an attempt to figure out what the clinic might look like once built. I put the mock-up together with Live Interior 3D Pro, which is a paid program for Mac, but if I had to do it again, I'd probably use Google Sketch-Up, which is less aesthetically pleasing, but more flexible and free! Please forgive the lack of colour-coordination and details in this version! We still have lots of design work to do!